One of 6 mills on the river Flit, the mill was originally built by the Monks of Dunstable Priory. Records show a mill on this site since the 1085 Domesday. The crown wheel is a horizontally mounted wheel on the first floor, the 'stone floor'. It is connected via an upright shaft from the great spur wheel on the ground floor. 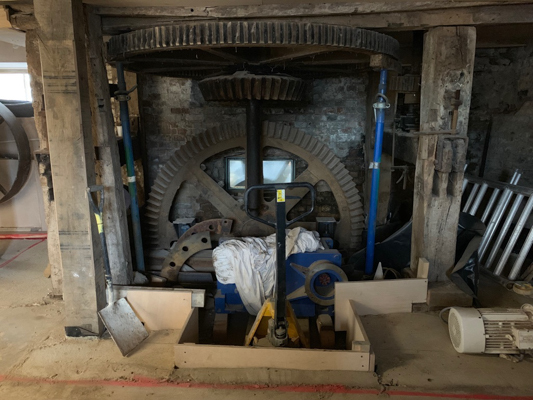 The crown wheel drives a shaft on the first floor from which a number of belts were used to drive machines such as the bolder, corn cake crusher, oat-roller and extractor fan.